The 2014 Nissan Xterra is rugged enough to tread where modern crossover SUVs dare not venture, namely deep off-road. 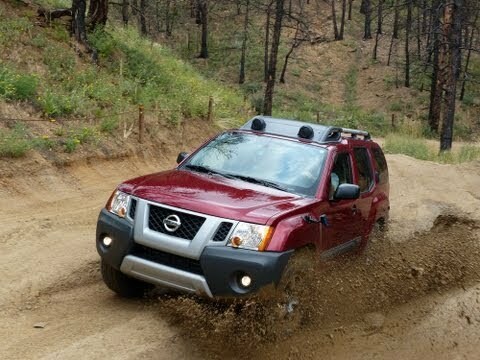 Never intended to be a luxury cruiser, the Xterra makes no apologies for its simple interior, firm ride and tough-as-nails reputation. This is a vehicle for people who love adventuring, getting lost and bouncing over boulders and snow berms. The Nissan Xterra is made to the best quality standards. The interior is more comfortable than you would expect. The truck can handle any terrain, it is extremely Versatile. It is spacious and safe. It has good modern features like seat warmers and a built in navigation system. There are no significant problems with this truck. It is built so the driver has full control over the car which is difficult in a car of its size. Great purchase, you will not regret it. We love the vehicle so much we bought a frontier as well. No fancy gadgets inside, it is made primarily for outdoor use, and does well with 4x4 capabilities. I love the racks on top, but they are not quit wide enough for a canoe on top of the vehicle. The round racks make it hard to brace items well. The back end is plastic and easily cleaned, I would love that feature throughout the whole vehicle. It is perfect for people who live in the countryside. Great for hauling groceries, my bike, two kayaks, my dogs, and my friends. Handles snow and mud well so it is a great car for those who live in the country or in areas with frequent bad weather. Comes in all kinds of colors and different packages. Affordable for the most part if you buy used. Steering can take a little while to get use to.